The League sets a high bar, which is likely one of the reasons you’re using it. But that also means your League bio and “Interests” examples need to rise to the occasion – not only to get you off the waiting list, but also to attract the kind of matches you downloaded the app to meet. The League About Me examples you’re about to get will help convince her to forget about your competition – and focus her attention on you! Let’s start with the easiest section first – your Interests. A lot of guys either skip this part entirely, or treat it as a throwaway. Don’t make those mistakes! Having something specific to ask you about makes it easier for her to send the first message. People tend to be more drawn to you if they perceive you’re similar in some way, and the same taste in hobbies could spark a connection. League profiles are short, so adding a few more details here helps round out the mental image she’s building of you as she checks out your profile. But you don’t want to add just any interests – you want to add keywords that optimize your attractiveness. Specific details make you seem more genuine, relatable, and compelling. And when it comes to exclusive dating apps, everything counts either for or against you – so you need to put some real thought into every single word you choose to include. Physical activities work especially well for this profile section. From her perspective, kiteboarding is a physically challenging activity that requires a high level of fitness. So you get instant attraction points right there. (And if you have a pic, water sports are a perfect way to show off your abs in a setting that doesn’t involve a bathroom mirror). It’s also an activity that’s somewhat dangerous – and women are instinctively drawn to men who are courageous and willing to take risks. That’s a lot of positive impact for a single word! 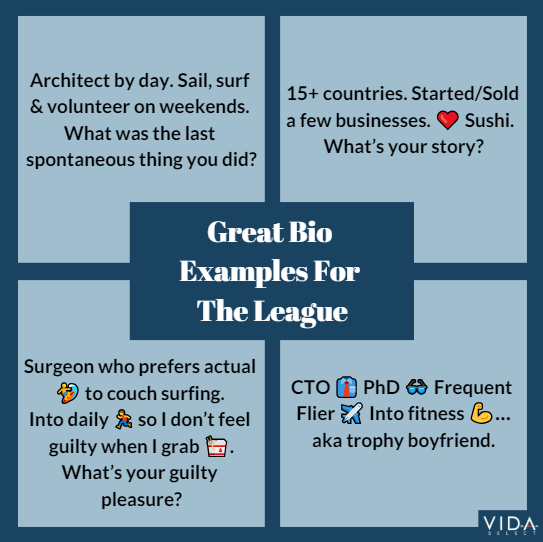 Surfing, scuba diving, cliff diving, hang gliding, CrossFit… if it’s a physically demanding sport and you’re into it, put it to work in your League profile. Other hobbies imply that you’re health conscious and disciplined, another huge point in your favor as she’s determining if you meet her definition of “datable.” Yoga, running, training for marathons, meditation, martial arts… you get the gist. What do all those entries have in common? They can all be enjoyed from the comfort of your couch! In other words, what she’s getting between the lines is this guy loves his TV. Generally on a dating app “doing” is more intriguing than “watching” – because she’s going to imagine what spending time with you could be like. In her mind, the idea of going on a nature walk at sunset is likely far more appealing than the thought of catching “Friday Night Fights” on Animal Planet with you. You also want to seem like a well-rounded guy with a wide range of interests – so not everything you list here needs to be physical – it just needs to be intriguing. In fact, the last thing you want to do in a short dating app profile is list too many hobbies that are the same type of thing, like sports. She may dismiss you as being a ‘one note’ kind of guy, whereas she’s looking for more depth. Interests that also just happen to make great dates are effective additions to your profile. Wine tasting, exploring museums, live music, Broadway, discovering new food trucks… whatever you enjoy that she may like doing with you will instantly boost your attraction rating in her eyes. You’ve got 140 characters max to give her a compelling argument as to why she should match with you, return your message, and meet you in person. That’s a lot riding on a short dating app profile! 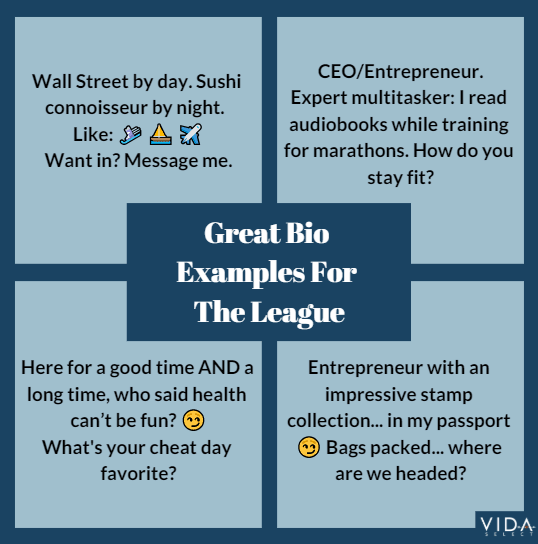 Much like the Interests you select, you want to mention things in your League profile that highlight multiple attractive traits at once. One of the main reasons these League bios are so successful is they adhere to the “Show/Don’t Tell” rule for dating profiles. See what a difference giving an example of how you embody a specific trait is far more intriguing and genuine than taking the generic route? Don’t just say you’re “very active” or that you “love traveling” – give specific examples that prove it. She’ll feel more attracted to your profile that way, and you’ll set yourself apart from all the other profiles she’s already skimmed. Also consider the deeper meaning behind the things you choose to mention. You want her to come away with the impression that you’re successful, financially stable, and physically fit with a range of interesting hobbies. Welcome to the world of exclusive dating apps. Anything less than that and she’ll probably move on to checking out her next potential match. Hobbies that require a high level of fitness, are slightly risky, and require a dash of courage. That’s a nearly irresistible combination for women. Places you’ve traveled to, the more exotic the better. This subtly lets her know you have the financial means to fund exciting vacations, and she’ll imagine what it would be like to visit those places with you. Activities that show you can set goals and stick to them, like training for a triathlon, getting your pilot’s license, or obtaining a SCUBA certification. Words that illustrate your “nice guy” side. According to data analysis from a major online dating site, guys who had words like “knight in shining armor,” “thoughtful,” and “give back” got 60+% more messages. Things that show she’s in for a treat if she dates you. That could be your culinary skills, your lake house, your yearly trip to Australia – anything that gets her excited about the prospect of dating you. Speaking of her – taking up a few of those 140 characters to draw her into your profile is a smart move for two reasons. The first is based on science. Researchers found the “golden ratio” of you:her in a profile is 70:30. The other reason is simple – by asking her a question, you’re sending a clear message that you’re interested in what she has to say. To borrow a principle from Marketing 101, it’s a version of a Call To Action. Posing a question in your profile gives her plenty of direction for sending you a message – she simply needs to answer it and your message exchange has begun. Don’t have a lot of time to carefully craft your League profile? For the first template example, just change the emoji to represent you. For the second example, just swap in your occupation, something you’re “devoted” to, and emoji that represent a few of your most appealing interests. Making the glass half empty. Negativity is both a mood and an attraction killer – the last thing you want your profile to do. Past relationships, hints of drama, things you don’t like – if it’s not optimistic, leave it off. You may be recently divorced, but don’t put that loaded term in your bio – she’ll likely assume she’d be dating you and your emotional baggage. Be sure to describe you job in a positive way. “Finance drone” doesn’t sound like a successful guy who’s invested in his career. Veering into red flag territory. Sometimes this is a by product of humor. You’re trying to make a joke, she doesn’t take it as one – and boom, you’ve lost her. Best not to mention emotionally loaded words like guns, violence, drugs, etc., even in a joking manner. With such a short character count, negative words resonate more than they would in a longer profile. The problem is it’s not clear if he’s making a joke about eavesdropping, or if she’ll actually find him with his ear pressed to the office door while she’s chatting with her best friend. If it’s not a positive character trait, don’t mention it in your dating profile! By that same token, don’t take up valuable profile real estate mentioning things you don’t have. Why make yourself seem inadequate from the get go? In the example above, he’s made all those dog & boat owning guys that much more attractive by comparison. Forgetting to proofread. Grammar, spelling and the like are important in any dating profile, but the shorter the bio, the more glaring the mistakes. Don’t jump through all those hoops just to torpedo your first impression with a typo. Don’t Let Lack Of Time & Expertise Sabotage Your Results! If you’re looking for League About Me examples because you don’t have time to write one from scratch, you’ve just gotten 10 good options. But getting the results you want on The League requires more than just a compelling, intriguing profile. You also need a flattering, attention-commanding primary photo, a picture lineup that makes her curious to learn more, and messaging skills that can close the deal. You’re not looking to settle when it comes to finding your ideal partner, and neither is she! That means you have two choices – put in all the hours it takes to refine your profile and stay on top of messaging, or outsource it all to industry experts. That’s where VIDA comes in! VIDA’s modern matchmaking service is the perfect solution for successful guys like you who simply don’t have time for the daily maintenance dating apps require. Our team of dating professionals will combine your high standards with our ten year’s worth of industry research and knowledge – which translates into dates with incredible, intelligent, “Total Package” women. All without you having to do any of the work! Want to learn more?